this is a kit we threw together, it have four 1" hex x 1.25" tall high voltage stand off 's that have a 1/4-20 metal tapped mounting insert on each end. 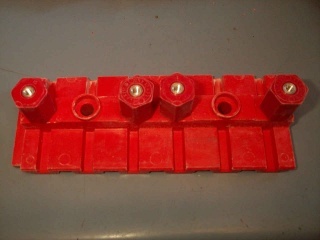 the mounting plate is 9-1/4" x 3.5" and is an electrical buss mounting plate, so it is also insulated. you can mount the four stand offs to the plate, then mount the plate on the wall or where you wish! great for your solar power inverter and battery bank arrays!